Usually a live and rare compilation can have a few underlying possibilities for motive: a quick and amicable contractual fulfillment before label and band part ways, a stopgap to release something new for fans in between albums, or a simple compilation to appease a die-hard fan base with cult-like tendencies. 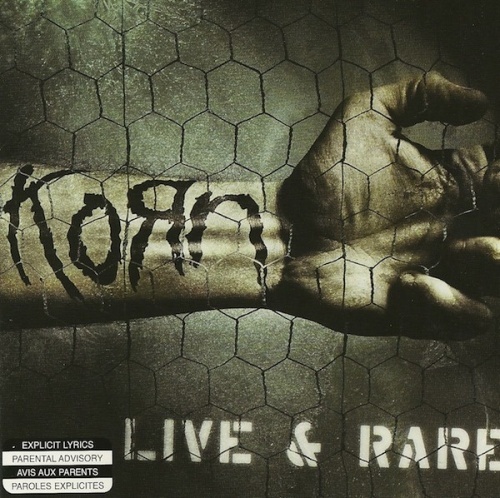 Hedging bets, this Korn compilation serves two of those three purposes right off the bat. It's been a while since the group offered something new, and to appease the loyalists who would very well purchase a disc of Jonathan Davis bagpiping English football anthems, Korn had the good sense to compile a disc that's one-half a live recording of their greatest hits and one-half an assortment of rare stuff and cover songs. Recorded in 2003 at CBGB's, Live and Rare is exactly what you'd expect from the band, and for fanatics that's a wonderful thing. But this could also easily serve as a catch-up guide for those who never really were into Korn, but need a place to hear some of their most well-known anthems. Covers of Pink Floyd's "Another Brick in the Wall, Pts, 1, 2, 3," Metallica's "One," and a hysterical take on "Earache My Eye" round things up and find the band having fun performing covers, much like Metallica's now legendary Garage sessions. Collectors might already have all of this stuff scattered over several discs, but having them remastered and all in one place makes this an attractive disc to add to the collection. It should properly pacify rabid fans until the next full-length comes around, or until that disc of bagpipe anthems finally hits the stores.